SCORES of youths from the ruling Patriotic Front (PF) have threatened to boycott this year’s youth celebrations scheduled for tommorrow citing poor leadership and the party’s failure to fullfil the campaign promises. The youths have also accused Kabwe District commissioner Patrick Chishala and the two area Members of parliament of being insensitive to their plight. And government officials from the district commissioner’s office today blocked the youths from entering the boma conference hall where they wanted to have a youth day preparations meeting, a move that has annoyed the youths and vowed not to move out of the premises until the hall was opened. 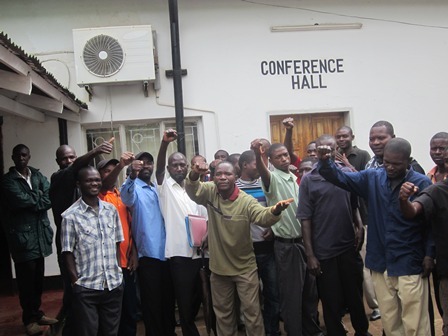 The youths told the Zambian watchdog that the government has failed to honour the campaign promises made to the people of Kabwe, such as the reopening of the giant Mulungushi textiles, creation of employment through road contractors and youth empowerment schemes. “They were coming to us kneeling and we campaigned and voted for them until they won now they have forgotten about us,” said one of them. They accused District commissioner Chishala and the two MPs Sydney Mushanga and James Kapyanga for Bwacha and Kabwe central constituencies respectively of being insensitive to their plight. “Our DC has become big headed, as if he was not just a primary school teacher and as for Kapyanga and Mushanga, they are completely useles, these are the people that are making the name of the president and the party go down,” they said. Mushanga has been accused of creating parallel political structures to counter the opposition from his party’s youths who have been expressing their dissatisfaction with his performance. Meanwhile the district Boma office Hall which is mostly opened to the public for state functions was today locked to bar the PF youths from using it for their planned preparatory meeting ahead of tommorrow’s youth day celebrations. A check by the Zambian watchdog found scores of youths standing outside as they demanded that the hall be opened for them to have their meeting but officials from the district office said they were under strict instructions from the district commissioner not to open the hall. The youths accused Chishala of having pocketed the money for the celebrations hence his avoiding them, when they demanded to meet the DC they were told that he was not in the office, even as late as 10:00hrs. “How can they tell us that the man (DC) is not in the office, today is Monday and he is supposed to be in the office by 08:00hrs, we will not move until the place is opened and we get the money for the youth day,” they vowed. They have since threatened to boycott the youth day celebrations if they are not given the money and say that they will beat up anyone they will see masquerading as a PF youth, to teach the local leadership a lesson. On Friday scores of PF women confronted home affairs deputy minister Alfredah Kansembe at the Kabwe civic centre grounds after they were allegedly not paid the money they were promised for participating in the women’s day activities. The irate women mobbed Kansembe’s official vehicle until she had to be driven off after a lengthy deliberation with the women in tyhe council mayor’s parlour. By 11:00hrs, central province minister Philip Kosamu was in a meeting with some youth’s representatives trying to resolve the impasses.